Lighting-Gallery-net - Christmas Lights/400 christmas light set. Ok i have used this set once, and since then it was too much work putting it up and taken down, plus the string of lights are hardly bright at all it takes a 24v DC transformer And when it gets to the last 100 sets of lights they hardly glow up. This set flashes on off with a twinkling bulb in series of 10s and some of the series of 10s don't work at all. This was the set the wasps came out of hibernation and one bugger stung me. This runs off a 24v transformer?? Do all your mini lights run off low voltage transformers like that since your mains is 240v? Most of the other sets i have like 20 set ones do run of the 240v there normally 12v each bulb. seams to be the older 90s 80s sets though like my globe ones. Here many miniature lights use a 24 V transformer without rectifier (but bigger ones (so normal) have lamps in series connected directly to 230 V). I think the reason for the transformer and low voltage is that the wires (including insulation) can be made small without causing risk of electrocution. Thrown way strings is a great source of free 10-50 VA 24 V transformers. Most houses here are not fitted with RCDs, since it was not required in new houses until quite recently (2000). But with miniature lights, it is not just the wires that are thin, the sockets are also small with short distances between metal parts and the outside. If it is used outdoors, water may find its way in to the questionable sockets. Many of these things are intended to be used outdoors. It will, but will you touch it ? 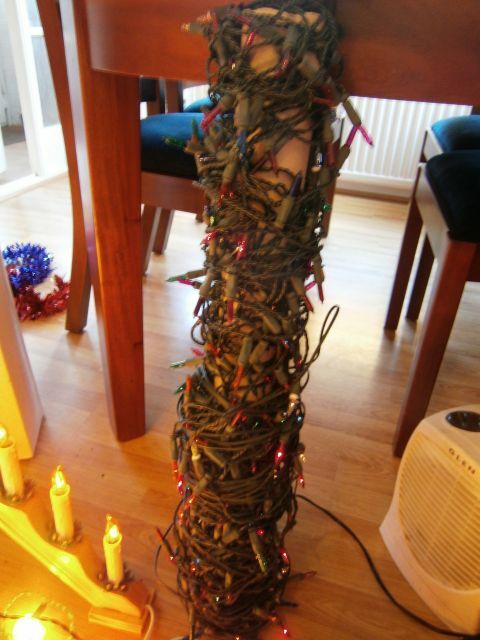 When I wrote 'It', I was refering to the lights (near a socket), not the tree, but typical christmas trees have branches within 40 cm of ground, easily reachable by even a child.. I just remembered something (OT but anyway): In my home town, there are two (living) trees, one of which has been the town christmas tree (the other isn't even of the correct tree type). If I recall correctly, each of these has single wire connected to the tree itself close to ground level, apparently made by making a cut in the tree and putting the wire there (and the tree has healed nicely around it, and is holding the wire well). What could have been the purpose of this? Perhaps this was used to ground the tree (why? ), or to only have to provide a single conductor to all the lamps. The latter would obviously require each lamp to be connected to the tree, which seems troublesome and resistance might be too high for this purpose. The tree known to have been used as a christmas tree still had big incandescent lamps (but not lit) when I visited it last time (probably close to 10 years ago). I will investigate how the lamps (probably still there) are connected soon. Pretty much all our mini lights are 120v/mains powered, the sets themselves seem to be just fine getting wet - no corrosion/sparks/etc (and water _does_ get in the sockets). years ago I found out...don't grab hold of the set if its been rained/snowed/sprinklered/etc on and is still wet...LOL there's a pretty good chance you will get shocked. All Xmas lightsets here have fuses (unless they're old ones) it is a safety requirement. connected to end to end about 9 or 10 100 set string. leaving little head room on the fuses. on the strings. our bulb have shunts in them too. but it cant be very reliable. LED seem to taking over becase of better reliabilty.